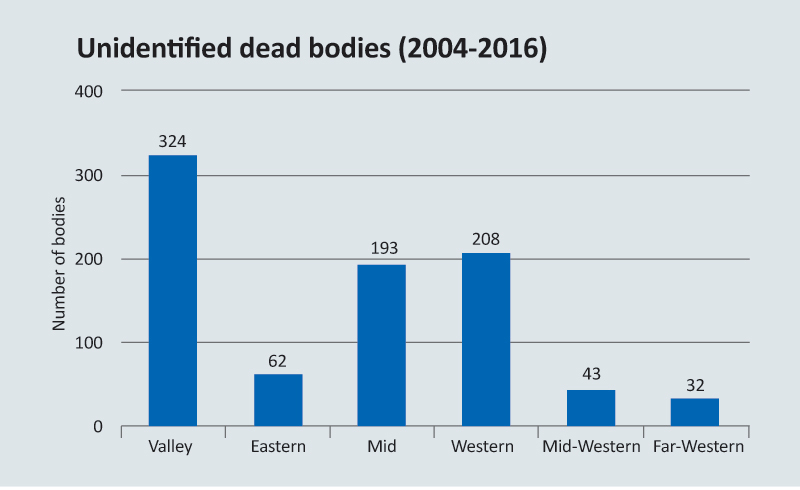 KATHMANDU, Aug 18: Recent reviews carried out by the Crime Investigation Department (CID) of Nepal Police have turned up 862 unidentified bodies in the police files, some of them dating back 15 years. With hopes of identifying these dead and solving the mysteries surrounding them, the CID has sought all particulars from the five regional police offices and begun uploading the information on the website of Nepal Police, including images of facial features. Some of the images are disturbing. “So far we have uploaded details pertaining to 310 unidentified bodies from across Nepal in the website, and where photographs are lacking the available details will be uploaded,” DIG Bijaya Lal Kayastha of CID said. Nepal Police had begun collecting details from unidentified bodies since the past few months as they were frequently asked about such bodies by various stakeholders, researchers and the kin of missing individuals. Whatever minute information is known to us is included in the website under the 'Unidentified Dead Bodies' section, along with available photos, he said adding that even some minor detail might throw light on a mystery. A few years back, the body of a man of about 45 remained unidentified for months at Gajuri police office, Dhading for months. The body was among those recovered from a river following a fatal road accident. After failed attempts to identify the body and as there was no place where the body could be preserved for a longer time, police cremated it as per the legal procedures. The family of the deceased had not looked for him as he had informed them that he would return in two weeks. Unknown to them, he had also changed his travel plans. After about three months, the body was identified as that of Basudev Shrestha, on the basis of a side bag possessed by him. He was a staffer at the Central Cooperative Training Center, Kathmandu. “The family had not felt alerted by the road accident in Gajuri as they did not know he was headed that way and the police had not bothered about the details that could be gleaned from the side bag,” according to Dr Sugam Jung KC of Tribhuvan University, who recently completed research on the status of unidentified dead bodies in Nepal. “There are dozens of such cases where the dead have remained unidentified simply for the lack of minor upgrades in the investigation mechanisms of law enforcement agencies,” the researcher said, adding that it becomes a serious human rights violation when someone is incorrectly put under the 'unidentified' category, sidelining any chances of identification. CID investigators said that in a few more weeks they would be completing the uploading of details collected from regional police offices in their website. “As we continue updating the details of unidentified persons in our website, anyone can check it to identify missing kin,” DIG Kayastha said. Police investigators have also found that some people who were previously reported missing have been categorized as unidentified dead in the web base system. In last year's devastating earthquake, about three dozen dead bodies remained unidentified for lack of a proper web base system and tools to preserve and analyze evidence.